Corporal Imrie was a member of Company F, 2nd Battalion, 38th Infantry Regiment, 2nd Infantry Division. He was Killed in Action while fighting the enemy in North Korea on November 27, 1950. His remains were not recovered. For his leadership and valor, Corporal Imrie was awarded the Distinguished Service Cross, the Purple Heart, the Combat Infantryman's Badge, the Korean Service Medal, the United Nations Service Medal, the National Defense Service Medal, the Korean Presidential Unit Citation and the Republic of Korea War Service Medal. The Distinguished Service Cross is awarded to Corporal Robert K. Imrie, United States Army, for extraordinary heroism in action while serving with Company F, 38th Infantry Regiment, Second Infantry Division, on November 27, 1950, near Yong Bong Dong, Korea. The platoon of which Corporal Imrie was a member of a platoon that was ordered to retake a hill which the enemy had seized during the operations of the previous night. On approaching the crest of the hill the platoon was subjected to intense machine-gun crossfire and the advance was halted. 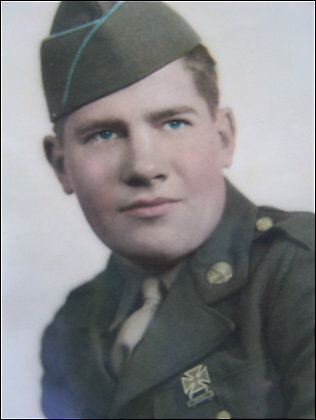 Corporal Imrie, aware of the possible annihilation of the entire platoon by the deadly machine-gun fire, single-handedly charged the machine-gun position on the right flank, completely disregarding his personal safety, and continually fired his automatic weapon until he had neutralized the position. After neutralizing the right flank machine-gun, he was hit by a burst of fire from the machine-gun on the left flank and mortally wounded. His gallant and intrepid actions had diverted the enemy machine-gun fire from his platoon, thereby saving his comrades from annihilation and enabling them to eliminate the one remaining machine-gun position and secure the objective. They are Sergeant Donald C. Trent, of Crab Orchard, West Virginia; Corporal Robert K. Imrie, of Randolph, Massachusetts; and Corporal Samuel Wirrick of Lancaster, Pennsylvania; all U.S. Army. Imrie will be buried Monday at Arlington National Cemetery near Washington, D.C.; and Trent and Wirrick will be buried at Arlington in October. In late November 1950, these soldiers were members of the 2nd Battalion, 38th Infantry Regiment, 2nd Infantry Division, then operating south of the Chongchon River in North Korea.Their regiment's positions came under heavy attack by Chinese forces and the 2nd Battalion was forced to withdraw to positions near the town of Kujang.On Nov. 27, Imrie was killed in action, and Trent and Wirrick were reported missing. In 2000, a joint U.S.-Democratic People's Republic of Korea-Korean People's Army team, led by the Joint POW/MIA Accounting Command (JPAC), excavated a mass burial believed to contain the remains of U.S. soldiers who died near Kujang.The team found human remains, Wirrick's identification tag and other material evidence associated with U.S. Army infantry equipment. Services for Corporal Imrie will be held at the Post Chapel, Fort Myer, Virginia, at 1300 hours on 23 July 2007. 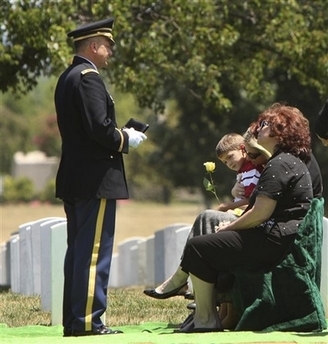 Burial with full military honors will follow in Arlington National Cemetery. On November 27, 1950, Army Corporal Robert K. Imrie charged a Chinese machine-gun nest that had pinned down his platoon in a murderous crossfire on a hilltop in the far north of Korea. Firing his automatic weapon continuously Imrie wiped out the enemy position, but he was hit by a burst of fire from a second nest. With enemy fired diverted by Imrie's actions, his comrades destroyed the second nest and captured the hill. But Imrie, 23, was mortally wounded. For sacrificing himself to save his platoon, Imrie was posthumously awarded the Distinguished Service Cross, the Army's second-highest honor. But his body was left behind as the U.S. 8th Army withdrew in the face of a massive Chinese counteroffensive. The body lay in a remote corner of North Korea for half a century. Today, at Arlington National Cemetery, Imrie will be buried with full military honors. Imrie's remains were identified and brought home in part through the efforts of two Northern Virginia women who wanted to find an uncle who died before they were born, but who they always heard was a hero. Imrie's nieces -- Fran Anderson of Alexandria and Anne Imrie of Arlington County -- will be joined at the funeral by a delegation from Randolph, Massachusetts, the soldier's home town. "We're trying to celebrate that short life," said Anne Imrie, 49. "It's emotional. I didn't think it would be." Robert Imrie, who joined the Army in 1948, was shipped to the Korean Peninsula with the 2nd Infantry Division after North Korea invaded South Korea in June 1950. After breaking out from the Pusan Perimeter, the division and the rest of the 8th Army drove toward the Manchurian border. But in late November, hundreds of thousands of communist Chinese troops crossed the border in a massive counterattack, sending the 8th Army reeling. The 2nd Division was assigned to protect the withdrawal of the U.S. forces. Imrie's platoon, part of F Company of the 2nd Battalion, 38th Infantry Regiment, was ordered to retake a hill near the town of Kujang that Chinese troops seized the previous night. When the platoon was stopped by machine-gun fire, Imrie advanced alone until he was killed. "His gallant and intrepid actions had diverted the enemy machine-gun fire from his platoon, thereby saving his comrades from annihilation and enabling them to eliminate the one remaining machine-gun position and secure the objective," according to the 1951 citation that accompanied Imrie's award. Robert Imrie's younger brother, Aubrey Imrie, a career Air Force officer who retired in the Washington area and died in 1986, had not told his daughters much about his brother. They knew that the Defense Department had made widespread use of DNA testing in recent years to investigate remains from the Korean and Vietnam wars and from World War II. In 2000, Imrie's nieces decided to have the family submit a DNA sample to a registry operated by the Defense Prisoner of War/Missing Personnel Office. "It had to be on the maternal side," Anne Imrie said. "We tracked down one of his uncles living in Nova Scotia." Victor Leroy Tulk -- Robert Imrie's uncle -- who was then 92 and has since died, submitted a blood sample. In 1996, after negotiations, the U.S. military began excavations in North Korea, searching for some of the more than 8,000 U.S. service members missing in action from the Korean War. By 2005, when excavations were suspended because of rising tensions with North Korea, the remains of more than 225 service members had been recovered. In 2000, about the time that Tulk's blood sample was entered into the registry, an excavation team investigated a burial site near Kujang. Human remains had been plowed up in the area years earlier by a North Korean farmer, who moved them to a different location. The farmer's son took the team to the new site. Excavation uncovered the commingled remains of several humans, along with the dog tag of an American soldier, Cpl. Samuel Wirrick, a member of Imrie's unit. The laborious process of identifying the remains through dental records and DNA samples at the military's identification laboratory in Hawaii was not completed until this year. "The resolution of cases several decades old is a methodical, painstaking process," said Larry Greer, a spokesman for the Missing Personnel Office. "It requires the gathering of historical, circumstantial and biological evidence. And often this evidence is available only from our former enemies. This real-world process bears scant resemblance to fictitious versions of the forensic programs we see on television." Imrie's nieces were notified in May that the remains of their uncle had been identified. "It was such a goose-bump moment," said Anne Imrie. "We never thought that it would happen." Two other identifications have been made from the remains found near Kujang -- Wirrick of Lancaster, Pa., and Sgt. Donald Trent of Crab Orchard, West Virginia, both with the 2nd Battalion, 38th Infantry Regiment who were reported missing the day Imrie was killed. Their next of kin have been identified, and both will be buried at Arlington in October, according to Greer. Last month, an Army team briefed Imrie's nieces on the circumstances of the recovery and on Robert Imrie's brave end. The briefing left both women sobbing for the uncle they never knew. Said Anne Imrie, "It brought him to life." Randolph war hero has ‘come home’: Corporal Robert Imrie buried in Arlington National Cemetery. On a slope in Arlington National Cemetery overlooking the Washington Monument and Jefferson Memorial, Army Corporal Robert K. Imrie was laid to rest nearly 57 years after being killed in a battle on a North Korean hilltop. The remains of Cpl. Imrie, who grew up in Randolph, along with those of two other soldiers, were recovered in 2000 and identified earlier this year. For nieces Fran Anderson and Anne Imrie, it was a chance to honor the uncle they had never met, knowing him only from photos and stories. Their grandmother, Ethel Imrie, was Corporal Imrie’s mother. She died at the age of 89 as a result of injuries suffered in a 1991 fire at her home on South Street. Their father, Aubrey Imrie, was Corporal Imrie’s only sibling. Aubrey Imrie spent 30 years in the Air Force, retiring as a chief master sergeant, and died in 1986. Anne Imrie was impressed that residents and officials from her uncle’s hometown of Randolph ventured to the nation’s capital for the services. Anderson, Anne Imrie and their mother, Ann Imrie, all live in Northern Virginia. During a service at the red brick Memorial Chapel at Fort Myer, adjacent to the cemetery, Army Chaplain Lieutenant Colonel William O. Barefield said that those who are buried among the white tombstones of Arlington are a select group. ‘‘Arlington National Cemetery is a place where you earn the right to be,’’ Barefield said. Corporal Imrie did so when he ‘‘stood between the nation’s enemies and the freedoms we enjoy,’’ he said. A member of Company F, 38th Infantry, 2nd Infantry Division, Corporal Imrie's platoon was ordered to retake a hill near Yong Bong Dong in North Korea in 1950. When they neared the top of the hill, the platoon was caught in the crossfire of two machine guns. Disregarding his personal safety, Corporal Imrie single-handedly stormed one of the machine guns and knocked it out of action. He was killed by fire from the other. The Army awarded Corporal Imrie the Distinguished Service Cross, the military branch’s highest award for valor and second only to the Medal of Honor. In his last letter home to his mother, dated a week before his death, Corporal Imrie said he also had been awarded the Bronze Star and Silver Star for his efforts in earlier actions. He had been in Korea for about four months at the time of his death at the age of 23. Corporal Imrie attended Stetson High School, the forerunner of the current Randolph High School. He enlisted in the Army in July 1945, near the end of the World War II, and was discharged in 1948. He later re-enlisted, spending 16 months in Okinawa before going to Korea. After Corporal Imrie’s death, the platoon was forced to retreat and his remains were not recovered at the time. They were buried and later moved when the battlefield became farmland. 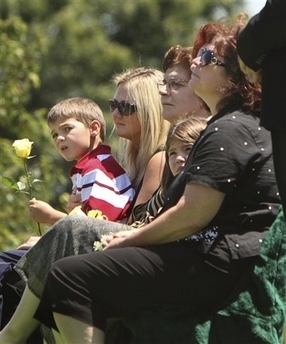 The remains were among those of six Americans recovered by U.S. officials in 2000, with the identification process completed earlier this year. A DNA sample from Corporal Imrie's uncle, Leroy Tulk, was used in the identification process. The brother of Ethel Imrie, Tulk died four years ago at the age of 92. 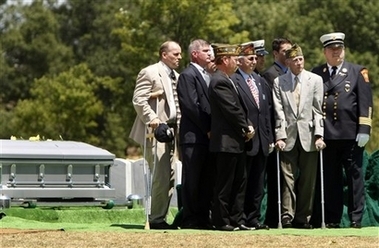 Imrie was buried with standard military honors, including an honor guard, a 21-gun salute and a bugler playing taps. 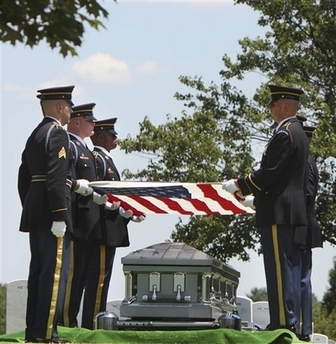 The honor guard lifted the American flag off the gun metal gray coffin, pulled it taut, folded it into a triangle, inspected it for the slightest wrinkle and handed it to Barefield. 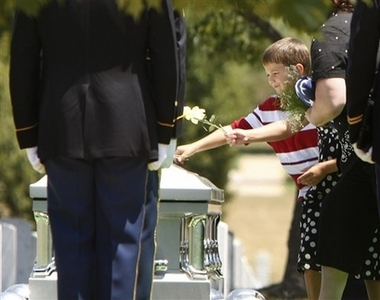 Family members of Army Corporal Robert Imrie, who was killed in action in the Korean War and whose remains were recently recovered, listen to an unidentified chaplain during funeral services at Arlington National Cemetery 23, 2007. From left are, great, great nephew Nathan Leite, 6, sitting on his mother's lap, great niece Carrie Anderson, and niece Francis Anderson, right. 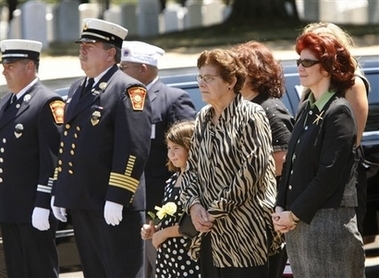 A contingent of officials and residents from Randolph, Massachusetts, pose for a group photo in front of the casket of Army Corporal Robert Imrie, who was killed in action in the Korean War and whose remains were recently recovered, following funeral services at Arlington National Cemetery Monday July 23, 2007. Second from right, on crutches, is retired veterans agent Jim Hurley, who assisted Imrie's mother with benefit issues after his death in the 1950's.